Ray Stanford, an amateur paleontologist, has amassed one of the world’s largest collections of Cretaceous dinosaur footprints in his farmhouse in Maryland. 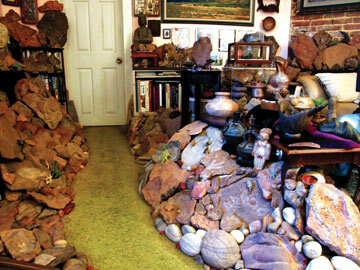 As soon as you walk through the front door of Ray Stanford’s Maryland home, you can see his passion for fossils: They are everywhere. A narrow path winds through each room of the old farmhouse, but everywhere else — on every table, bookshelf and windowsill, and piled knee deep on the floor — are fossils, so many that a few years ago, the creaking floorboards had to be reinforced with additional beams. These fossils aren’t shells or bones, though: They are dinosaur footprints, left a hundred million years ago on the shore of an ancient sea. Over the past 13 years, armed with only a wheelbarrow, hip waders and his keen eyes, Stanford has pulled upwards of 300 fossils from a rocky brook near his home. The sheer number of tracks is staggering and the diversity of species in his collection is unparalleled, say paleontologists who have visited Stanford’s home. In fact, these fossils have been touted by experts as some of the most significant footprint finds from the Cretaceous. Not bad for an amateur. Paleontology appeals to Ray Stanford, and to many hobbyists, because it is one of the few scientific fields where amateurs with basic equipment and little training can make extraordinary discoveries. The key to successful fossil hunting is often sheer luck, looking in the right place at the right time, Stanford says. And the truth is, hobbyists often have more time to spend looking in the field than professionals, says Roger D.K. Thomas, an invertebrate paleontologist at Franklin and Marshall College in Lancaster, Pa., and secretary of the Paleontological Society, an international organization of both professional and amateur paleontologists. “Amateurs contribute invaluably to science just by donating their time,” Thomas says. “The fact is, without them, some of the most important finds in paleontology would still be in the ground,” he says. But while most professionals support the work of enthusiastic amateurs, some harbor reservations about whether untrained diggers help further scientific study or impede it. In Stanford’s case, his collection is helping to further scientific study, says David Weishampel, a paleontologist at Johns Hopkins University in Baltimore, Md. Professional paleontologists first became aware of Stanford’s collection in August 1999, when his floorboards began to groan and Stanford set out to find an expert to assess whether his growing collection was of any scientific importance. Stanford convinced U.S. Geological Survey geologist Rob Weems to come to his house — and Weems turned out to be first in a parade of surprised scientists. Word spread quickly through the paleo-grapevine that a man in Maryland had found something extraordinary, Weishampel recalls. Thus far, 37 professional paleontologists from all over the United States have been to Stanford’s farmhouse to see his collection of footprints. Before Stanford began mining the small local stream for fossils, only a few scattered bones had been found in the region, and no footprints, greatly limiting scientists’ knowledge of dinosaur life in the region. Stanford’s discoveries opened a window into this ancient ecosystem, providing data on everything from species diversity to insight into how dinosaurs raised their young, Weishampel says. 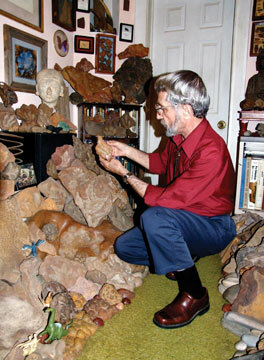 Ray Stanford’s collection of dinosaur footprints has taken over his house. The collaboration between Stanford and the professional community culminated last summer with an article in the journal Ichnos detailing the 14 dinosaur species identified from the prints. The symbiosis between professionals with their wealth of knowledge and amateurs with their abundance of time has often been helpful to the science, Thomas says. Where paleontologists take issue with amateurs is when they don’t report important findings to the scientific community, fail to record crucial information about the locality of the fossil, damage the fossil during removal or sell their find to private owners, he says. Those guilty of the last transgression, mainly commercial collectors, are by far the most vilified by professionals, says Kevin Padian, curator of paleontology at the University of California Museum of Paleontology in Berkeley. “Amateurs have always been greatly appreciated by professionals,” Padian says, but he “will have nothing to do with dealers” who put a price on priceless specimens. Many commercial collectors, however, do run reputable businesses and even have good working relationships with professional paleontologists. Bob Simon is the founder of Dinosaur Safaris, Inc., a company that takes children, students and other interested laymen on dinosaur digs in the western United States. Simon, who has a master’s degree in geology, says that he treads the middle ground between being a scientist and a commercial collector. His tourists usually turn up shards or isolated bones, hardly museum specimens, which he then sells on his Web site. There, anybody can buy their very own 150-million-year-old Allosaurus shinbone for $3,000. But when they unearth unusual fossils that might be scientifically significant, like when an expedition once found a full Stegosaurus skeleton, he immediately calls in the experts to ensure the fossils are excavated properly. He even sent the dinosaur to a museum on temporary loan for casting and study. “Sarah the Stegosaur” is now up for sale on his Web site, but only to museums or buyers planning to exhibit the skeleton to the public, he says. For the most part, professionals are eager to talk with avocational diggers about fossil finds, Thomas and Weishampel agree. Perhaps professionals and amateurs get along so well because their scientific motivations are similar. “Fossils, especially dinosaurs, bring out the kid in all of us,” says Thomas Holtz, a vertebrate paleontologist at the University of Maryland in College Park. Like most professionals, he has fielded many calls from breathless hobbyists convinced they have made a major discovery. Whether they really do have a great find or just a funny looking rock, he always gets a kick out of talking to amateurs. “Their enthusiasm is great,” he says. Before his battered floors give way, Stanford hopes to find a permanent home for his footprints, he says. A proposal for a temporary exhibit on local dinosaurs in the Smithsonian’s National Museum of Natural History in Washington, D.C., is currently in the works, though Matthew Carrano, curator of Dinosauria at the Smithsonian, hopes the donation will become permanent. Morton is a freelance writer in Baltimore, Md.